Most children growing up would be familiar with Pinocchio, his struggles and hope. Now, 2x2 Gaming uses Pinocchio to inspire hope in adults and with bonuses like these they sure do. This online slots game offers Wilds, Scatters, and even a Bonus Round. You can win. up to 12 Free Spins, gain Multipliers, and tons of Cash Prizes too. Pinocchio’s Fortune has 5 reels, and 30 pay lines. This online slots game also has a wide betting range of £0.30 to £90. Pinocchio’s Fortune is an online slots game themed around the beloved wooden puppet who discouraged kids all around the world from lying. Now he is back determined to tackle the adult slots market. And we must say, he is doing a fine job! The online slots game has done a great job with its graphics. The game board is an oaky brown much like the wooden puppet. And the accompanying background music is child-like and uplifting! WILD SYMBOL The symbol with Pinocchio’s puppet the Wild in this online slots game. The Wild can take the place of all other symbols, with the exception of the Scatters and Bonus symbols, in order to form winning combinations. 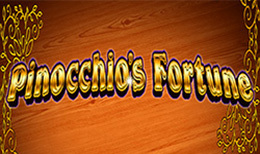 The symbol with a close up of Pinocchio’s Face represents the Scatter in this online slots game. If you land 3 or more Scatters, you will trigger the Free Spins Round. 5 Scatters = 12 Free Spins If you land Scatters during the Free Spin Rounds, Pinocchio’s nose will grow with each Scatter. When the Free Spins have ended, the scatters collected will translate to a prize which you will be able to select from the following screen. BONUS ROUND The bonus round is triggered by landing 3 of the symbols with fairy. These symbols only appear on reels 2, 3 and 4. This will trigger the bonus round, you will be given 4 spins that will help propel you along the path of the board game. If you manage to make it to the end, a hefty prize awaits. And if you don’t, worry not. There is plenty to be won along the way – Multipliers, More Spins, etc. Pinocchio is a children’s classic and 2 by 2 Gaming has done a good job bringing this wooden boy to life. The game offers Wilds and Scatters, and even a board game styled bonus round. It is always that much more interesting when you have a destination goal ahead of you. If not for anything else, try out this slot to relive some childhood memories!